Boulder, Colorado is such an entertaining town. It reminds me a lot of Santa Barbara - both are meccas for fit people who seemingly don't work, yet have access to a hidden tree with unlimited leaves of money. No matter how hard I tried, I couldn't find the tree, but I did find a lot of things to like about Boulder. Most significantly, there is a strong sense of community in this little town. So many friendly people and great support from the locals. Additionally, there is really something for everyone. 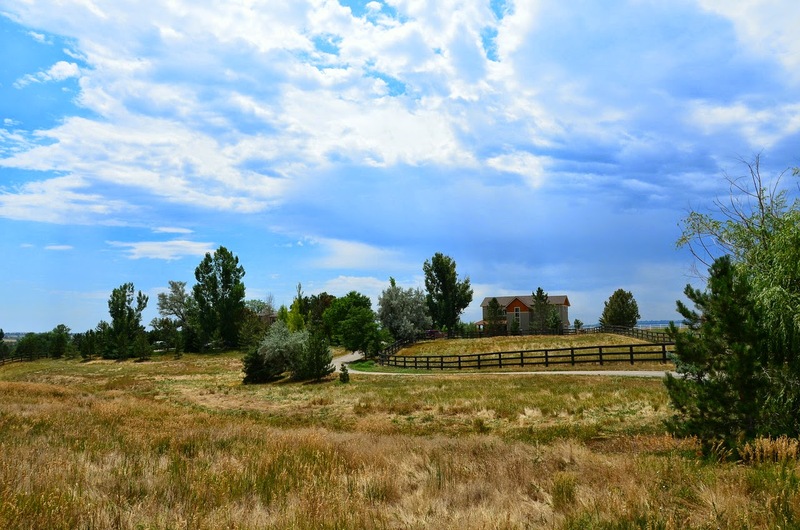 It is a little bit of urban nestled in rural surroundings. It's flat plains among the Rocky Mountains. 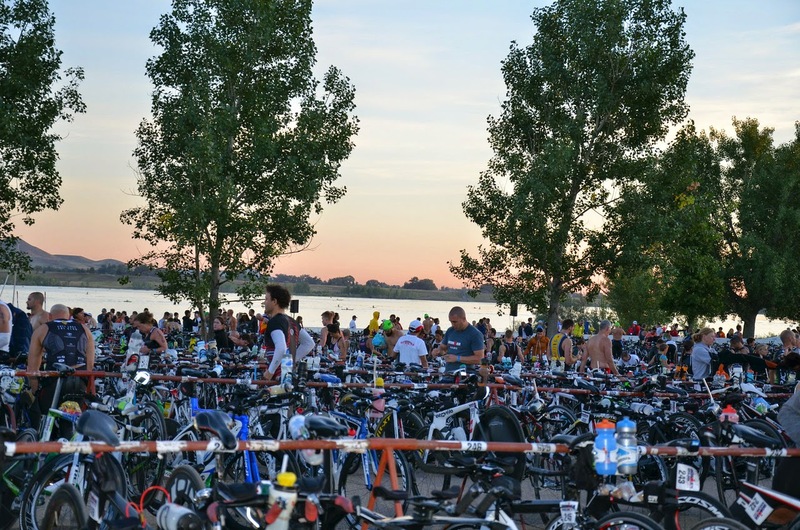 It's a place to race, as 2400 of us did this weekend, and become Ironmen. We opted to stay in the more rural part, East of Boulder, since the hotels in town were pretty expensive. To give you a sense of what it was like, here was our home for the week. It was incredible with some lovely views, lots of chickens, and a turtle. It was also right on the bike course, so I could hop out and train on the roads. The week of rain and cold and rainy weather had passed and left us with mild temperatures and a cooled reservoir - perfect for a wetsuit swim. Saturday was an absolutely perfect day, with no wind and cool weather. Too good to be true, and I was already anticipating this to be the calm before the storm. 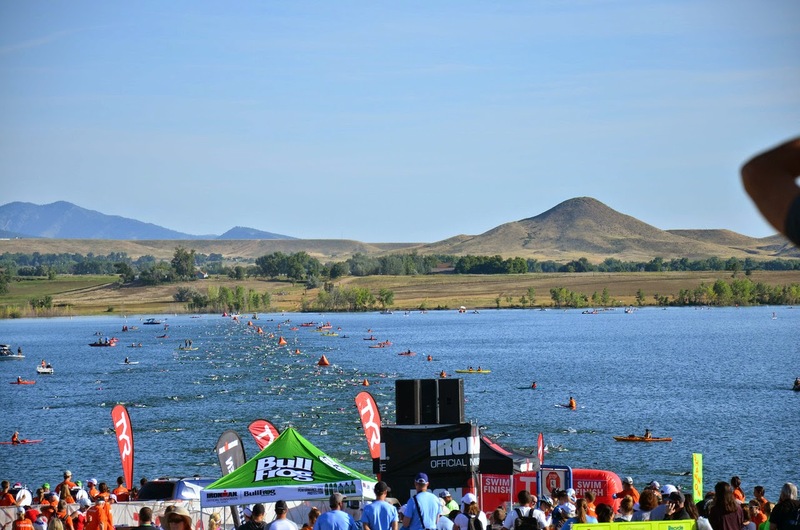 Despite the perfect conditions on Saturday, I was certain that the wind would kick in on Sunday, blowing us around on the swim as it did in St. George 2012, and that lightning bolts would take out half the swim field. Those of us who would make it to the bike would be greeted with tornadoes at the far eastern portion of the course. If we didn't get lifted into a twister, we most certainly would have been taken out by a projectile in the form of a triathlon bike. Those things are aero, and they'll take off body parts. I didn't even concern myself with worrying about the run, but the very few that made it there would be pelted with golf ball sized hail stones, or fry in 100 degree heat, but nothing in between. As you can see, I'm always thinking about the worst case scenario. The common theme? All of this was out of my control. I had done everything that was within my control. I was well trained, it was just time to execute. 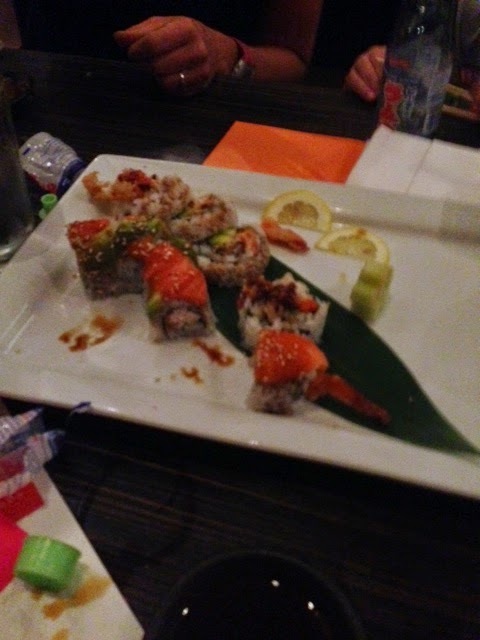 Pre race ritual of sushi dinner. Hasn't failed me yet! After a dinner tradition of eating sushi, and a surprisingly good night sleep (4-5 hours), I was up at 2 am on Sunday morning to get some yoga and meditation in. This always serves to give me a little morning flexibility and calm before a swim. Breakfast was a blueberry/banana/quinoa/oatmeal smoothie to be followed by a banana/oatmeal/almond butter smoothie two hours before race time. The whole day would consist of a liquid diet. This keeps it very simple for me, and has given me great success in the past. We were out the door by 3 am to get down to the high school to catch the shuttle. Well, I was going to catch the shuttle, my wife and kids were going to get more sleep in the car. Just a quick word about that. As Ironman athletes, we have to hand it to our families. My wife, kids, and parents woke up hours before the sun would rise to simply spectate at a triathlon. The times they would see me over the next 10+ hours could probably be counted on one hand, and would be brief. Yet they had smiles on their faces all day and enjoyed the hell out of it. It meant a great deal to me that they enjoyed the race, and that they chose to be there to support me. At the high school, I noticed that the breeze was picking up. Not heavy, but still a bit breezy. "Oh great," I thought. "Here it comes. I'll be fighting white caps the size of houses out there." I told myself to shut up and focus on execution. This is called "Ironman", not "Porcelain Boy". It was time to grow a pair. At the reservoir the weather was lovely. Light breeze, cool weather, water temperature of 74. Bike tires were inflated, nutrition was at the ready, toilet was used (about 4 times). All systems were go. I headed over to the corral where I was sure I would be overwhelmed by claustrophobia among the 3,000 other athletes jockeying for position. That wasn't the case. It was more like walking into a cloud of nervous excitement. As it was in Cabo, it was much like an out of body experience, as if I was watching it from the sidelines thinking "these people are crazy." And then the cannon fired. The rolling start is like a pressure control valve, only allowing a limited number of athletes to enter the water at a time, as opposed to the mass start which is a free for all. The rolling start really helps to spread out the field. I very leisurely followed my group standing within the 1:00 to 1:15 seeding area into the water and my race had begun. Very quickly I moved wide right to stay away from others and get clear water. This was great in that I had virtually zero contact the entire swim. Unfortunately, it also meant that I had no feet on which to draft. However, I knew that at this point my swim was a lost cause. I will focus on improving my swim in the off season, but for now the goal was to survive and get in between 1:15 and 1:20. The swim was relatively uneventful. It consisted of two turns, which made it very easy to navigate and break into parts. I would focus on getting to the first buoy, then the second, and then the finish. I counted my strokes and sighted every 20 - 40 strokes. This was effective and made for a pretty straight swim. Since I wasn't sighting very often, I accidentally jammed my finger tips into some poor woman's neck. She was resting in a vertical position, and my right hand came at full force like a Vulcan death grip into the back of her neck. She screamed in pain, and all I could do was apologize. I felt so terrible about that, but I really hope the rest of her race went well! After the second buoy, we ran into a lot of weeds. My arms had to come way up to avoid getting them tangled, and most of the 1,000 athletes which had already passed through had ripped it all up so that it was getting onto my face. The issue was very brief, and I continued to swim toward the exit. Getting up from the swim I saw my time and was disappointed, but it was what I expected. On my feet I felt very fresh for the bike leg. The first transition was a bit disorienting. Since I'm a slow swimmer, yet still want to go fast for the rest of the race, I am very out of place. Most of the people coming out of the water at this point are taking their time. I, on the other hand, want to get on my bike as quickly as possible where I can start to race strong. This is 100% my problem, so I have no right to be rude or pushy to those who are going slower. Once again, it just comes down to the fact that I have to improve my swim. I ran to the transition bag area and couldn't immediately locate my bag, and the volunteers were busy with other racers, so I had to backtrack a bit to get it. Running toward the tent, I noticed a lot of people changing outside the tent. I decided to follow suit, on the assumption that the tent was full of people. I got my helmet on, and nearly forgot my glasses (had to backtrack for those too) and carried my shoes toward the tent. It was my intent to run through the tent and get to my bike, but someone in front of me had other ideas. Note that above I mention that I don't want to be pushy, but in the middle of a race, if you're going to stand and rest for a while, don't do so in an active runway. I said "coming through" no less than three times before finally nudging my way by him. He wasn't too happy about that, but hopefully he had a little more consideration on the bike course. Blocking is against the rules. No matter, I was off and on to the bike. Over the past year, cycling has become my strong event. There are some difficulties associated with being a fast cyclist and a slow swimmer when there are over 2,000 people racing. 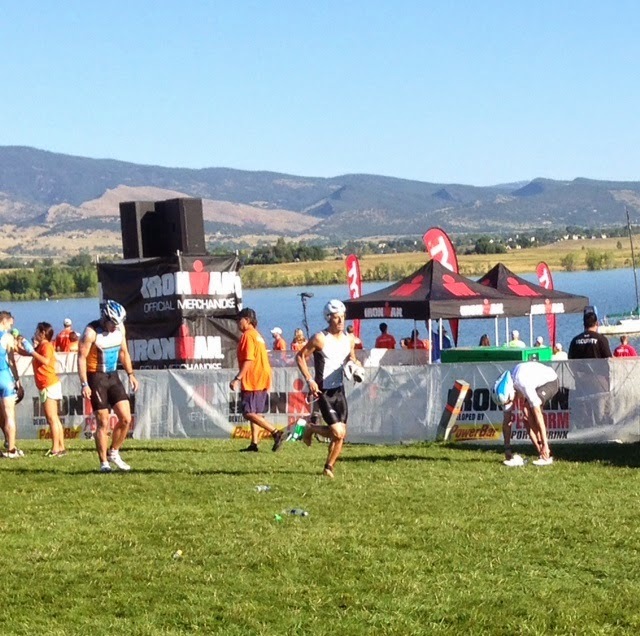 I finished the swim behind nearly half the field of racers. I had a lot of passing to do. The rules state that once you enter a person's draft zone (within 4 bike lengths) you have 20 seconds to complete the pass. Additionally, once you enter the draft zone, you can't drop back again, you have to make the pass. This means that a lot of energy has to be exerted to make a pass on another racer, since you can't sit side by side with someone and take your time making a pass. I passed over 900 athletes on the bike leg, which came to a rate of one racer every 20 seconds or so. Essentially, over the first 60-70 miles, I was constantly in passing mode. Perhaps I was biking too hard at the beginning but I was feeling good. Around mile 40, I ended up losing one of my aero bar pads. After going back to retrieve it (which cost me about 2 minutes), I realized that the Velcro was completely gone. I would have to ride the next 75 miles with no aero bar pad on my left side. Fortunately, it didn't bother me too much. If that was the only issue on the bike I was going to have, I would take it! Since I was going pretty hard at the beginning of the bike, I noticed my stomach nausea starting to pop up around mile 50. Fortunately at this point I was beyond the big packs and could back it off a bit. I dropped my heart rate back to the high 130's to let my digestive system catch back up. After this I found a really good rhythm. You couldn't have asked for better conditions on the bike course. It was sunny, but mild with not much wind. The wind we did have only gave a slight benefit as it was never really a head wind, and thus helped to propel me forward. The support out there was absolutely great. In the middle of nowhere we had people in lawn chairs cheering us on. This is what makes this sport fun. In the later miles of the course I was beginning to be all alone, which is how I like it. It was actually really nice and peaceful out there. I made it up the last couple hills, descended into town, and headed toward T2. After running out of transition, I decided that bloody feet were bloody feet and that I would push it as much as I could. Again, this was supposed to hurt!I felt great initially, and headed downhill along the creek path. The initial miles were good, and I was running low 8's while trying to keep my heart rate below 150. At this point on the run I was pretty much all alone. I became a little worried at one point and had to ask if I was going the right way. Thankfully I was, and I continued. I anticipated that the second time down this course it would become much more crowded. At the bottom of every hill you have to run back up, and that's just what we had to do after the first 10K. I decided to pace myself on the way back up and make sure I stayed hydrated. It was about here that I started to walk the aid stations also. I was beginning to start hurting early. I was able to keep my heart rate down, but I was just having trouble firing my legs. But, I kept running, albeit at a slower pace. With the punchy hills and false flats, this was truly a tough run course. Once at the top of the creek again, I was able to turn around and enjoy another downhill, but I was still hurting. Once at the bottom of the hill around mile 17 or so my legs were starting to shut down. I was having a lot of trouble getting my calories in simply because the honey stingers mixed with salt began to taste like bile. I did what I could, but at the remaining aid stations I began to take in coke. I was looking forward to the aid station on Pearl and Foothill because a video was supposed to play of my wife and kids at the Newton Running Lab. Unfortunately, my video didn't get triggered so I never got to see it. But the good news was only a 10K to go. 10K left was a place I was fantasizing about getting to at the beginning of the marathon, but once I got there I was dreading it. The next 4.5 miles would be up a gradual hill which ate me up the last time I climbed it. This time it would destroy me for sure. The marathon of an Ironman destroys your spirits. In each race, here and in Cabo, I got the feeling that I was blowing up and not feeling well at all. It was a demoralizing feeling that it would be impossible to finish with even only a small relative distance to go. But that's how this marathon is different and more significant than any other marathon. This marathon is all about a person's ability to suffer and persist. In this marathon you are going to have pain, you are going to feel like crap, you are going to want to quit. But you don't, and that's what makes you an Ironman. It was at the trough of this hill, looking at a 4.5 miles of uphill that I finally remembered this and continued to push through the pain. Even though there was 10K to go, I took it an aid station at a time, walking it and then running between them. People said I looked strong, and I wondered who they were looking at, because it certainly wasn't me. The last little hill was the hardest. It was about mile 24 that brought us to the very crest of creek path. At the top of that hill was a golf cart which signified the last turnaround and the last couple miles to Mike Riley's silky smooth voice. At the top of the hill I broke into sprint as I went downhill. I began to feel reinvigorated and full of energy. The pain had left me and I kind of felt a bit cheated, like I wish I had felt like this for the rest of the run. Once back at the high school, I hit the fork in the road with the two signs going to the left and right, "2nd Lap" and "To finish". As I turned to the right the people cheered me on as if I had won the race. 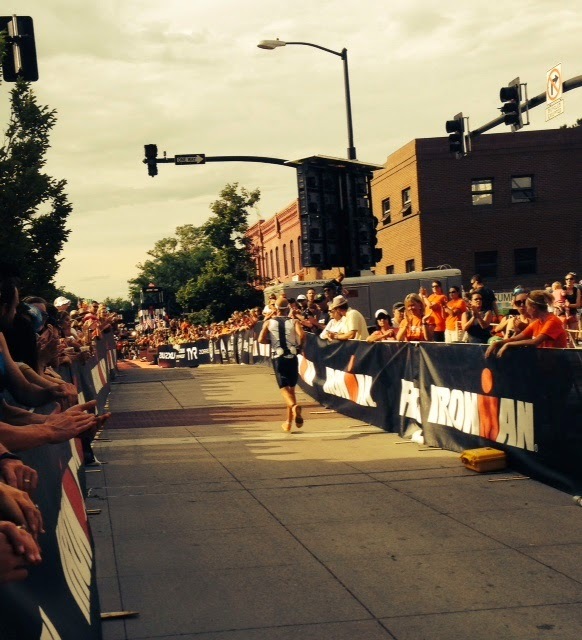 Turning onto Arapahoe I saw the mass of spectators lining toward 13th and the finish line. I saw nobody ahead of me as I approached 13th. As I turned left toward the finish I looked behind me. Nobody. I was going to have this moment all to myself! I began to tear up at that moment. Thinking about all that I've been through to get here. The poor decisions I've made in the past, as well as the decision to improve my life culminated in this moment. This finish line was not a finish line at all, but a celebration of all that was accomplished. 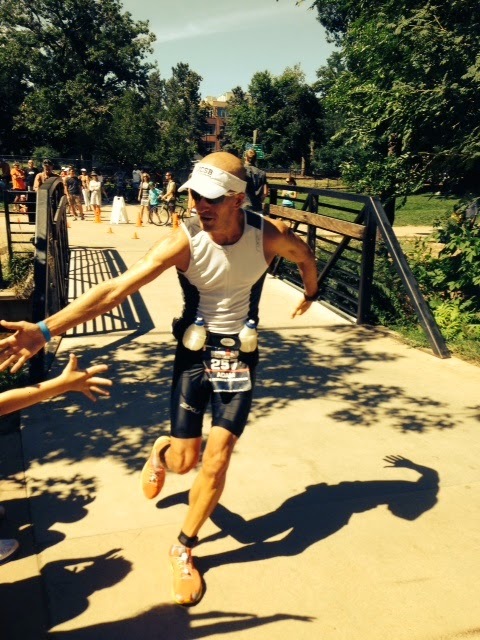 The big "Ironman" arch that I began to approach didn't signify an end, but a continuation. A doorway to a greater chapter of life. I heard the cheers and took it all in with a final spin at the finish line. 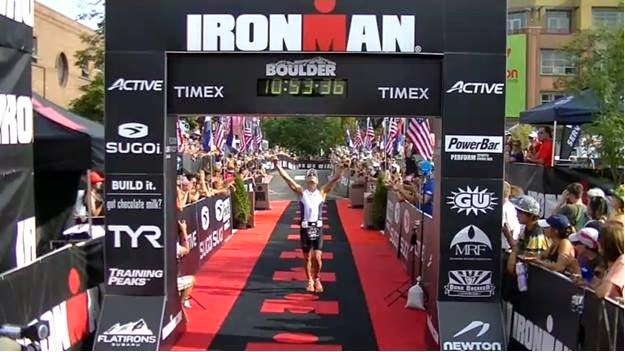 I couldn't quite hear what Mike Riley had said, but it was along the lines of "a few years ago he was out of shape and abusing alcohol, but today he's an Ironman." It wasn't the trademark "You are an Ironman! ", but it's a better message, and more personal. It reminded me of why I had done this, and hopefully inspires people that they can make a dramatic and positive change in their lives. After the finish line I found my wife and hugged her and cried. It was a long and hard day, especially with the run, but I had done it. More than 2,000 others would do the same that day for their own reasons, big and small. I had hoped that I could run a 3:30 marathon, but it wasn't my day for that. The run course was just too tough. I know that a lot of people had a hard time with the run course, and the times reflected it that day. I am very happy with my time, and only hope to continue to improve over the next year so that I can meet Mike at the finish line again in Kona. By my math, I was about 6-7% off of a Kona time at this race. Looks like 10% improvement is still in order! A big thanks to everyone who supported my fundraising goal for charity:water. Also, to my wife, kids, and parents for coming out to support me. Boulder was a wonderful city to host this event, and I'm sure it will only improve next year. I am signed up and will see you then!